Houston, TX: Precision LLC has redesigned and redeveloped its brand to reflect its presence as a modern, innovative, pioneering supplier of couplings and connections to the OCTG (oil country tubular goods) industry. 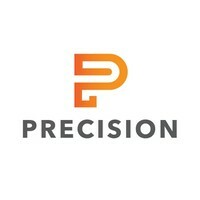 The company partnered with Powered Labs to create an updated visual identity that reflects Precision’s dedication to producing industry-leading products, as well as its unparalleled focus on personalized customer service. “Precision is comprised of the brightest engineers and product developers in the country,” says Mike Nations, Engineering Manager at Precision. “We are driven by the passion to provide the best quality solution for our clients with minimal risk or profit loss in the production field,” says Mr. Nations. PC6 & PC8 Premium Tubing Brochure sxPrecision designs and distributes API couplings, premium and semi-premium connections that are used in hydraulic fracturing operations to extract oil and natural gas by drilling horizontally in shale rock formations. Highly complex and variable conditions have placed high stakes on engineering the safest and strongest solutions for maintaining pipe connections throughout production zones. Precision has leveraged its ingenuity to create outstanding products that give peace of mind. “Oil exploration is an industry that is often misunderstood, therefore it was essential that we underline the extraordinary process that Precision undergoes to ensure maximally safe and responsible products,” says Mine Salkin, VP of Marketing at Powered Labs. “Safety, efficiency, reliability, and support are at the core of everything Precision touches, and every aspect of the brand needed to indicate that,” says Ashton Couture, Founder & CEO of Powered Labs. Powered Labs helps Enterprises Design, Develop, and Amplify digital products for the future for web, mobile, and beyond. We are an industry leader, design-first, future-ready, cutting-edge digital team ready to unleash new possibilities for your Enterprise and amplify your growth. Specializing in enterprise businesses, we offer a suite of custom services spanning from software development to brand identity and digital marketing to high-level consultancy services. Our modus operandi? To see companies grow and achieve uncommon success. We create products to empower your future. Powered Labs has offices in Tampa, Houston, and Miami.